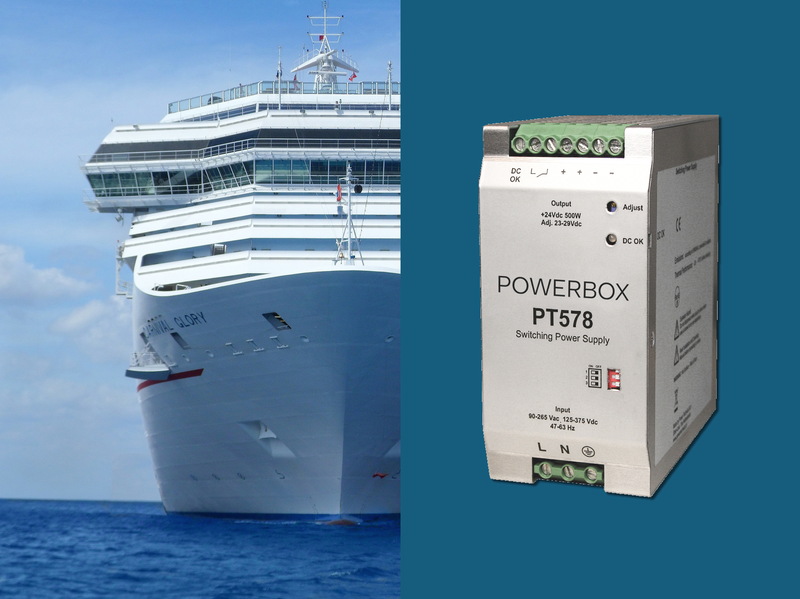 Powerbox, one of Europe’s largest power supply companies and a leading force for four decades in optimizing power solutions for demanding applications, has announced the launch of its second generation of power supplies dedicated for Marine applications and demanding industrial systems. Responding to a demand from Marine equipment manufacturers to simplify logistics and to reduce energy consumption, the PT578 integrates programed digital protection, built-in redundancy and paralleling circuitry. Based on latest technologies, the 500W PT578 has a typical efficiency of 94% and can be operated between -25 to +70°C. It includes an active PFC, three output protection modes firmware reconfigurable, is designed for convection cooling and is protected against humidity and corrosion with conformal coating and can withstand high shock and vibration levels. The technology developed for the PT578 is suitable for immersed computing systems requiring the power unit to operate safely within neutral fluid containers and part of PRBX Custom Power library. The requirements imposed on products responsible for shipping and offshore installations are greater than the average for industrial and office environments, requiring power designers to follow strict design rules and to select components and technology complying with international standards. The limits regarding mechanical and climatic requirements are also more demanding than for typical industrial applications. Vibration levels up to 4g are common, as well as large temperature fluctuations from -25°C and + 70°C and high relative humidity where condensation cannot be excluded. The new product, PT578 integrates the latest power technologies specific to the Marine Industry offering a unique combination of electrical and mechanical performance. To guarantee the highest level of safety, marine power architectures and immersed computing designs often require redundant power sources. To ensure this, several power supplies are usually connected in parallel, linked to each other through external ORing diodes modules. To simplify installation and utilization, the PT578 has built-in circuitry making it possible for the user to select if the power unit will be used in “Single Mode” or “Parallel mode with droop current sharing.” This also reduces the number of products to keep in inventory as well the space used in the power rack. Depending on the application, the output protection may need a different type of configuration (Switch off, Hiccup mode or Constant current), which is one of the features included in the PT578. Based on firmware defined profiles and the output protection the mode of operation can be selected via a DIP switch with factory default settings though, in case of specific demand, it is possible to reconfigure any of the profiles at one of our PRBX Configuration centers. The unit also includes a DC OK signal and a potential free relay contact for fault protection. A front LED indicates power unit status (OK or Fault). When Constant Current mode selected, the PT578 behaves as a current generator and is suitable for high capacitive loads, driving DC motors, and as well an ideal solution to charge a second level battery backup for critical equipment such as navigation systems. PT578 will operate with wide AC input voltages of 90 to 265 VAC and with a DC Bus voltage of 125 to 375 VDC. The input AC frequency is of 47-63Hz, and for naval airborne 440Hz with reduced PFC. Covering a large range of Marine applications, from sea to air, the PT578 is specified to operate up to 10.000 feet and up to 30.000 feet in non-operating. Two versions with adjustable output voltages are available in standard, 24VDC (23 to 29VDC) and 48VDC (47 – 56VDC) with an output power of 500W with peak power up to 750W during 10 seconds. Designed to meet international Marine requirements, the PT578 complies with vibration specified in the DNV-GL table 7 High vibration strain, class B, ±1.6mm displacement, 2-25Hz, 4g; 25-100Hz (1 octave/min). Protected by a conformal coating the PT578 works in a humid environment of up to 100%, condensing at all relevant temperatures and meets the IEC60947-2 2kV, 60s. The product has an isolation of 3000VAC Input to Output and 2000VAC Input to Chassis. Using high density integration building practice, the PT578 is housed in a 132 x 67 x 128 mm (excluding the DIN-Rail mounting device) cassette-box, which is one of the most compact 500W power supply in its category, saving critical space in the power shelf to fit more functions per rail. The PT578 also meets and complies with related chapters of the EN61000-3 and -4, EMC Emissions EN60945 conducted & radiated, Conducted LF IEC60533 3VRMS, 50Hz-12kHz, EMC Directive 2014/30/EU and DNV-GL Temperature class D, -25 – +55°C; Humidity class B, up to 100%, condensing; Vibration class B, ±1.6mm displacement, 2-25Hz, 4g; 25-100Hz; EMC Class B, CLASS GUIDELINE, DNVGL-CG-0339, Edition November 2015. Pending at date of publication.